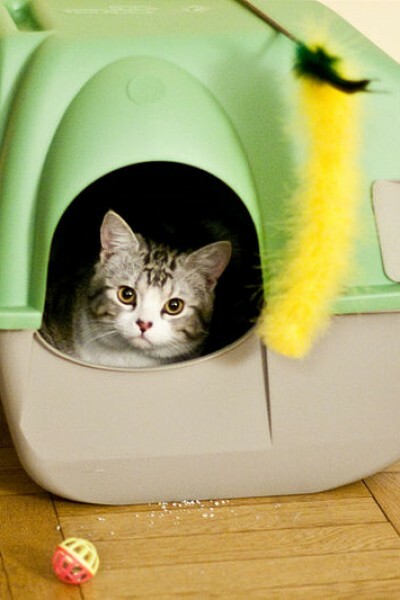 Litter box training is really not so much directed towards kittens but to owners that need to be taught: which type of box works, where should it be placed, how many per cat and many more things that go into making a kitten happy. Kittens really don’t need much litter box training, if at all, when going to a litter box. Kittens will often head to a small cardboard litter box with an opening low to the floor surface even before they open their eyes at 2 weeks! It is the psychology of the kitten and adult cat that drives owners crazy concerning litter box training etiquette. Kittens learn the special dance learned during litter box training. The box is approached, the kitten sniffs, gets in the box, sniffs, scratches, gets in the position to use it, scratches the litter again and sniffs, than exits. If any, and I mean, any of these steps are not done in order the whole process stops. This means that there is a good possibility that the kitten will soil outside of the box! This is important to understand if you ever want to: change the box, change the litter type or change the location of the box itself. Kittens are creatures of habit with a capital H. Change any of those parameters and they may not use the box. In these situations litter box training has to be relearned. Each home should have about 1 and a half litter boxes per kitten or adult cat. So for 2 cats, you should have 3 boxes. For 3 kittens you should have between 4 and 5 boxes. The size of these boxes should fit the size of the kitten. You do not want a kitten using a pole vault to jump into an adult box; it is too high. 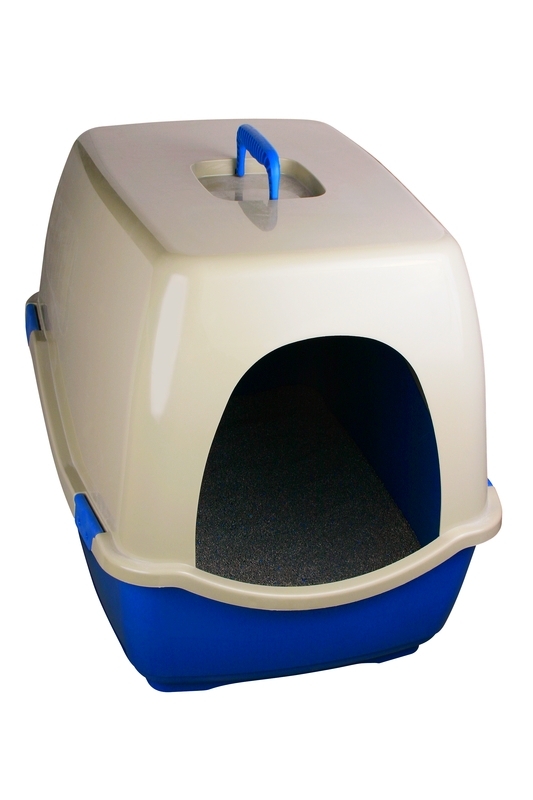 Purchase a shallower tray that is easy to clean and big enough to hold the movements of one cat in the box. That will facilitate litter box training. Litter boxes can be as simple as buying some plastic trays at a home furnishings store or Home Depot®. They can also involve a hood that is attached to the base unit so that the kitten has more “privacy” and any litter that is scratched and flung all over the place stays inside the box and not on surrounding carpet or furniture. Other boxes go a step further and have mechanical systems that change litter as it is needed. I have no experience with the latter but people seem to be satisfied. Take a lot at what PetCo® has in its arsenal to satisfy every kitten fancier’s whim! Whichever type of litter you choose, try to stick with the same brand. Don’t be tempted to change it because you found a great sale on a bag of XYZ litter. These changes will alter the scratch, sniff routine of routine litter box training. Changing the brand or type of a cats litter is an invitation to cat disasters. Cats are very tactile creatures. Young kittens will get into their box as usual and feel the texture of the litter as they go through the motions. Than they discover……they changed the brand of litter…..HORRORS! What happens next is that the kitten will refuse to use the box and go right outside of it or elsewhere in the house. There are handfuls of cat litters on the market. When it comes to litter box training the choice is yours but there are pros and cons to each type. There are basically four types: clay based, sand based, crystal based and biodegradable pellets made from numerous types of wood. All have varying degrees of use such as how frequently the litter has to be changed as well as the degree of odor control a particular product has. They vary in cost so select a type that you think will fit your needs and try to stick with it. Take a look and see what is available from PetCo®. Litter box training not only involves choosing a litter box and litter but also picking where the boxes will reside in the home. You do not want to put a litter box in the kitchen or in any other high traffic area of a home. You do not want people tripping over them making a royal mess. These are going to be just suggestions since there are thousands of different home designs. 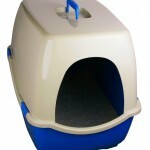 Litter boxes can be put in the area of the food and water dishes but that is not mandatory. The boxes can be in one area of the house and the food bowls in another. Kittens are very smart creatures and know where to go when it comes to litter box training. Utility rooms are very popular as well as basements if you live in a part of the country that has them. Benefits of basements are that the boxes can be kept out of site, odor control is great since most basements are quiet and it is not difficult to go downstairs and change the litter. People that have kittens and dogs need to modify their tactics. Dogs, particularly toy breeds, think eating cat feces is fun. This is known as coprophagy. The only way to stop this behavior is to elevate the litter box on an old end table or facsimile so that the kitten cat jump up into the box without the dog being able to get to the box contents. Litter boxes should be evenly distributed around the house. If you have two kittens don’t put the boxes next to one another but evenly around the house. If you have a two level home put a box on each level so that if the kitten has to go, the distance to a box is not so great. Litter box training can fail miserably due to many reasons. When kittens or adults refuse to use the litter box you have to start playing 21 questions; like when dealing with a crying baby. Did you: change the box location?, change the litter type?, forget to clean the litter box?, move furniture around?, new baby in the house?, new anything in the house?, maybe a bladder infection? The list goes on and on. Regardless of the cause, the kitten has to be confined in a crate or bathroom with its litter box, food, water and blankets. The only exception to this, is a kitten (or adult) that is seen straining in the litter box to urinate. Most people think the animal is constipated but in truth the kitten could have a urinary tract infection or worse, a urethral obstruction. This requires an immediate trip to the veterinarian. Once the kitten is using the litter box again let the kitten out and have a trial period. Watch what it does in the regular litter box. Over time, with patience, this usually works. However, some animals do not adapt. This is how indoor cats become outdoor cats.